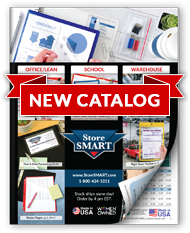 StoreSMART's Magnetic Push Pins will not only hold your paperwork securely in place, but they also add a fun pop of color! Use them at home, in the office, practically anywhere! Whether you're using them to color code tasks or just want to use your favorite color, our "push pins" will do the task beautifuly! 20 magnetic "push pins" per pack. Four each of red, yellow, green, blue, and purple. Each "push pin" has a strong magnet that keeps your papers in place. Great for home and office. Perfect for lean management with visual controls. Document Holder - Window Frame Style - Magnetic - Holds 2 ¾" x 11"
Magnetic Closure Pocket - Magnetic-Back - 11" x 17"